The tangled connections that have bound Jews to African Americans in popular culture and liberal politics are at the heart of Michael Rogin's arresting and unnerving book. Looking at films from Birth of a Nation to Forrest Gump, Rogin explores blackface in Hollywood films as an aperture to broader issues: the nature of "white" identity in America, the role of race in transforming immigrants into "Americans," the common experiences of Jews and African Americans that made Jews key supporters in the fight for racial equality, and the social importance of popular culture. 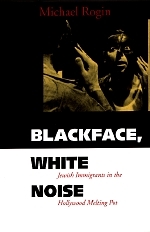 Rogin's forcefully argued study challenges us to confront the harsh truths behind the popularity of racial masquerade. Michael Rogin is Robson Professor of Political Science at the University of California, Berkeley. His books include Ronald Reagan the Movie: And Other Episodes in Political Demonology (California, 1985).